The Crisis and the Euro Barry Eichengreen University of California, Berkeley April 2009 1. Introduction When fire breaks out in an apartment house, one quickly learns who is prepared to run into the burning building to rescue the infirm and who runs out in order to avoid being singed by the sparks. The great credit crisis of 2008-9 is just such a characterrevealing crisis for the euro area and its members. It is revealing of which member states are prepared to run in and which, if any, are contemplating running out. It has provided new information on the effectiveness of the European Central Bank (ECB) as financial fire brigade -- as liquidity-provider and lender of last resort. And it has taught us important lessons about whether the residents of this particular neighborhood are really solidarity minded or simply watching out for their own. In addition, the crisis has highlighted long-standing criticisms of the architecture of this particular residential complex. The debate over the advisability of establishing the single currency has been rekindled by suggestions that monetary union was responsible for or, at a minimum, aggravated the crisis. Observers have been prompted to ask, with more urgency than before, what kind of renovations should be undertaken to ensure the safety and stability of the edifice, including perhaps a single financial regulator to complement Europe’s single market and the euro area’s single currency. Thus, prices rose by a cumulative 110 per cent over the period in the euro area, versus 113 per cent in the United States (Gros 2006). 2 Hilbers et al. (2008), Table 2. 3 IMF (2008), Box 3.1. 4 Spanish data are from Source OECD, Portuguese data from Blanchard (2006). 5 Given that the euro-areas current account was balanced in the aggregate, this implied corresponding surpluses in other countries, notably Germany. The tendency for current account balances to widen relative to the pre-euro era, owing in part to the removal of exchange risk within the region, had been highlighted by Blanchard and Giavazzi (2002). Moreover, external deficits were not randomly distributed. Gros (2008) shows that the correlation in the change in housing prices and change in the current account across euro area countries in 1998-2004 was 0.8.6 Once the housing bubble burst and capital inflows to finance current account deficits dried up, very serious economic and financial difficulties eventuated. And the advent of the euro played a role in the development of these excesses and imbalances. With delegation of their national monetary policies to the ECB, previously high interest rates in countries like Ireland and Spain came down – from 4 ½ per cent in Spain and 5 ½ in Ireland in 1997, when the decision on initial membership was reached, to less than 1 per cent in 1999.7 It was not only that inflation, driven by inertia and generous wage increases that pushed up the prices of nontradables, was higher in the Celtic and Mediterranean fringes in this period – though it was. In addition the change in the level of interest rates, which now converged to those prevailing in Germany, increased housing affordability and goosed demand. And strong demand fed back into relatively rapid increases in wages. With prices marked up over wages, higher inflation meant still lower real interest rates. The other mechanism linking external deficits and housing prices was the greater tendency to subsidize the housing sector in countries at risk of external sector weakness, where governments sought to substitute domestic demand. Van den Noord (2004) observed that in small open European countries where the loss of competitiveness might be thought to do the most to dampen the effects of lower real interest rates, governments and regulators also allowed the highest loan to home value ratios and by extending the most generous tax subsidies for housing, stimulating the internal boom. Osborne (2005) more generally confirms that national housing market development are shaped by both monetary policy (real interest rates) and domestic regulatory policies. As they observe, the domestic impact operates not just through the direct impact on residential construction but also the indirect wealth effect on consumption. (An attempt to quantify this wealth effect for different euro area countries is Andre and Girouard 2008.) These issues have been prominent in the UK debate over adopting the euro (where one argument of the euro skeptics is that greater reliance on variable rate mortgages and higher mortgage debt ratios mean that the same monetary policy changes will have larger effects on the economy). 7 Where nominal interest rates are deflated by the harmonized index of consumer prices following Aherne et al. (2008). Immigration was running at 2.5 per cent of total population in Ireland and 1.5 per cent per annum by 2005-6. 9 This is what was presciently warned of by van den Noord (2004). 10 The mechanism is documented by Saiz (2007). 11 By the middle of the decade there were warnings of potentially dangerous vulnerabilities from authorities such as Barclay’s Capital, as reported in Oxlade (2005). conventional approach to inflation targeting advised against attempting to targeting asset prices. The strongest argument for monetary union in this context was that the UK had its own independent monetary policy, but its central bank, similarly wedded to the conventional wisdom of inflation targeting, refused to act against the bubble. The problem was not so much monetary union as it was a rigid application of the doctrine of inflation targeting, procyclical fiscal policy, and failure to use supervision and regulation to limit excesses and financial and property markets. Even if an independent monetary policy, so framed, might not have prevented the crisis, those facing the most serious prospects of deflation following its outbreak would presumably have preferred to see the ECB cut rates even more sharply than it actually did and for it to move even more dramatically in the direction of quantitative easing. Thus, finance minister Brian Lenihan, in his April 2009 supplementary budget speech, warned that Ireland’s price level was set to fall by 4 per cent in 2009. The implication was that even the ECB’s very low interest rates implied high real rates for Ireland, whose residents would presumably prefer the hypothetical world where they still possessed a national currency which could fall by a third against the euro, much as the pound sterling had fallen since the outbreak of the crisis, raising import prices and thereby stemming deflationary pressures while enhancing export competitiveness. 3. Insiders Out? Thus, the crisis of 2008/9 is precisely the kind of asymmetric shock warned of by early euro-skeptics and highlighted by the theory of optimum currency areas. Housing prices fell euro-area wide, but they fell more dramatically in some countries than others. Since April of 2008, Intrade, the on line prediction market, has offered for trading a contract that pays off if any euro area country announces its intention of dropping the currency on or before December 31st, 2010. As of early April 2009, the pricing of the contract implied a 20.5 probability of this event. wages only after an extended period of high unemployment that weakens the demand for their services economy wide. Here the daylight-savings-time argument for currency depreciation is compelling. The question of who goes first and concerns about relative wages are averted through rising import prices, and the rise in unemployment is limited by improved export competitiveness. The counterargument is that countries can also engineer wage reductions by negotiating a social pact. In small countries especially, it is possible to get representatives of all the sectors around a table, as Ireland did in the 1980s. There are other ways besides currency depreciation to break the logjam, in other words. And even if, despite all this, the temptation to exit the euro area remains, the technical barriers would be almost impossible to surmount. It would be straightforward for the parliament or congress to pass a law stating that the state and other employers would henceforth pay workers and pensioners in the new national currency. But with wages and other incomes redenominated into that national currency, it would become necessary to redenominate mortgages and credit-card debts of residents as well. Otherwise currency depreciation would have adverse balance-sheet effects for households, leading to financial distress and bankruptcies. But with mortgages and other bank assets redenominated, bank deposits and other bank balance sheet items would have to be redenominated in order to avoid destabilizing the financial sector. With government revenues redenominated into the national currency, not just public-sector wages and pensions but also other government liabilities, notably the public debt, would have to be redenominated to prevent balance-sheet effects from damaging the government’s financial position. Nitsch looks at trade openness rather than financial openness, but the two dimensions of openness are correlated. Among other things, trade over- and under-invoicing is an obvious conduit for disguised capital flows. Observant readers will note that my assessment differs from the market consensus as represented by Intrade. Place your bets. traditionally euro-skeptic Danes had swung around to favoring euro adoption.15 By the following spring there was the first-ever poll on adopting the euro that yielded a majority in favor in Sweden.16 Similar tendencies are evident in Eastern Europe. Hungary and Poland have both indicated that they may speed up the transition to the euro in response to the crisis. Poland for the first time specified a target date of 2012. Hungary would have to first repay its IMF loan, of course, but there too the crisis has generated new support for the single currency. The problem being that the convergence criteria require a country to keep its currency stable within the ERM II for two years in order to qualify for accession to the euro area. The crisis has underscored the difficulty of doing so in a volatile financial environment.17 Since the spread of the crisis to Europe in 2008, a number of Eastern European currencies, including the forint and the zloty, have fallen by as much as 30 per cent against the euro as deleveraging has caused capital inflows to reverse, exposing domestic economic and financial fault lines. Attempting to limit such depreciation to 15 per cent would be difficult in the presence of open capital markets which the candidates maintain as an obligation to the European Union’s single market.18 Central banks would be setting themselves up as targets for speculators. Sweden being a larger country, and having followed a policy of greater exchange-rate flexibility for some time, did not experience equally severe problems when its currency came under pressure following Lehman Brothers, but a similar change in the tenor of the debate over euro adoption was evident there. See Angus Reid (2008). Britain of course is something of a special case, having traditionally had one foot in Europe and one outside, and possessing relatively liquid financial markets of its own (by the standards of other European countries). 16 As reported in Eurointelligence (2009). 17 It has also made it more difficult for candidate countries to satisfy some of the other convergence criteria, such as those pertaining to budget deficits (3 per cent of GDP ceiling) and interest rates (long-term rates within 2 percentage points of the three euro area countries with the lowest inflation). 18 And, in some cases, as an obligation to the OECD. The alternative would be for the Eastern European aspirants to adopt the euro unilaterally.19 Eastern European governments would benefit from removal of the exchange risk premium, while incumbent euro area members would not have to dilute their control of ECB policy by giving votes to countries that had not yet met the formal admission criteria. In addition, allowing the Central and Eastern European member states to adopt the euro would likely lower the cost to Western Europe of providing emergency financial support to the East. In the event, the European Commission, the German Finance Ministry, and the European Central Bank have all reiterated their opposition to any bending of the Maastricht Rules. The displeasure of the ECB is significant, since it suggests that countries unilaterally adopting the euro would not receive emergency liquidity from the central bank at times of distress, vitiating the main argument for unilateral euroization. In addition, the displeasure of the Commission and the German government is significant because it suggests difficulties for countries that euroize unilaterally and then seek to graduate to full membership in the monetary union. One would wish a more flexible response better attuned to the extent of financial distress on the part of those holding the keys to the euro area. That said, the controversy is revealing of the fact that adoption of the euro has become more attractive as a result of the crisis, not less. As suggested by the IMF in a report leaked to the Financial Times, See Wagstyl (2009). See for example de Grauwe (2009). the lengthening of refinancing facilities described above. Following the failure of Lehman Brothers, the ECB granted banks unlimited liquidity at prevailing policy rates under the terms of a new “fixed-rate full allotment” tender procedure. It lengthened the list of eligible assets that banks could pledge as collateral. And it increased the number of counterparties that are eligible to take part in its refinancing operations. Given the bankcentered nature of the euro area’s financial system, it was argued that this was a more appropriate focus for central bank interventions than, inter alia, large-scale purchases of commercial paper, securitized student loans, securitized auto loans and other creditmarket instruments of the sort that play a more important role in U.S. financial affairs and were the target of purchases by the Fed.21 While there is something to this point, it confuses credit easing with quantitative easing. Credit easing, as defined by Bernanke (2009), means targeted intervention to restart frozen credit and banking markets. This is the policy in which the Fed engaged between October 2008 and March 2009 and that the ECB pursued with its lengthening of refinancing facilities, broadening of the list of eligible collateral and expansion of the list of eligible counterparties. Quantitative easing, in contrast, is the policy of attempting to avoid deflation by increasing the money supply and pushing down long-term interest rates, and thereby altering expectations of future central bank policy, through the mechanism of purchasing government bonds. This is the policy to which the Fed turned in April 2009. It is appropriate when a large output gap and incipient price-level declines create the danger of deflation. The case for it is distinct from the case for targeted interventions to ensure the continued free flow of bank credit to households and firms. A clear statement of this position is Trichet (2009). Thus, however creative may have been the ECB’s interventions in Europe’s banking system, its failure to cut policy rates faster and to turn more quickly to quantitative easing remain troubling. As noted by Bini-Smaghi (2009b). The Lamfalussey Framework distinguishes four levels of cooperation: a Level 1 of promulgating agreed core principles of EU legislation, a Level 2 of directives and regulations, a Level 3 of the implementation of EU legislation at the national level, and a Level 4 of enforcement by the European Commission. Another potential problem is that financial conglomerates increasingly operate in multiple domains: banking, securities underwriting, and insurance alike. This creates an argument for a single regulator not merely across national markets but also across financial functions. Thus, Alistair Darling has recommended merging the three committees. 25 See CEBS (2009). home-country supervisors could ask host supervisors to perform on-site inspections of host-country operations, and the home supervisor would feed its information into a common data base of the system. The European Prudential Supervisory Agency would have the power to take key supervisory decisions and the design of policy. If member states outside the monetary union are reluctant to see this responsibility vested with the ECB, then they will find themselves outside the single financial market as well as the euro area. If member states inside the monetary union oppose regulatory centralization, then they will have to opt for the renationalization of finance. Cross border subsidiaries will have to be independently capitalized and ring-fenced. The single passport will be no more. faster reaction of U.S. investors as, in the effort to deleverage, they liquidated prior foreign investments and repatriated their funds. But as deleveraging became global this logic became harder to sustain. The positive correlation between the Chicago Board Options Exchange Volatility Index (VIX) and the dollar exchange rate in 2008 strongly suggests that the dollar remains the principal beneficiary when global investors perceive an increase in risk. Some recent analysis (e.g. Chinn and Frankel 2008) has compared the sizes of the U.S. and euro area economies and argued that if the euro area becomes significantly larger – either through faster productivity growth or simple enlargement of the euro’s domain – there could come a tipping point where central banks shift the composition of their reserve portfolios en masse into euros. But, in fact, size alone is not enough; to be attractive as a form of reserves a currency needs a broad and liquid market. The crisis has revealed that, notwithstanding the expansion of euro-area bond markets, the market remains segmented on the basis of a set of national debt instruments that are imperfect substitutes for one another. Where the U.S. has a federal fiscal authority that issues homogenous debt instruments whose liquidity is effectively guaranteed by the Federal Reserve, different euro area countries issue bonds with very different risk characteristics, as evidenced by their spreads over German bunds – spreads that blew out in 2008 as a result of the crisis and associated banking and budgetary problems. Under what circumstances the ECB is willing to backstop the market in, say, Greek or Irish bonds is unclear, given the no-bailout rule preventing it from buying bonds directly from the issuer. The crisis also prompted discussion of whether it was desirable for euro area governments to issue a single euro bond backed by them jointly (Soros 2009). Initially, governments would agree on limited issuance of euro area bonds; such bonds would supplement rather than replace national issues and markets and be used mainly in lending to member states in financial difficulty. Over time, however, such issuance would become a stalking horse for a federalized budget and an EU bond market that fully replaced national markets. This was seen in some circles as a financial-engineering strategy for strengthening confidence in the public finances of countries like Greece, whose default might undermine the position of other member states. In other circles it was criticized as an opaque mechanism through which countries with weak finances would receive subsidies from the stronger counterparts. There was some justification for both views. But, in practice, issuance of such a bond is probably a precondition for the emergence of the euro as a serious rival to the dollar. Only when a homogeneous debt instrument with a euro-wide market comes into existence, when it is backed by the full faith and credit of euro area governments as a group, and only when it is backstopped by the ECB will the euro be in a position to seriously rival the dollar as a reserve currency. Whether the euro area requires a centralized fisc in order to survive is, at a minimum, questionable – especially if the members agree on burden sharing arrangements in response to cross-border bank insolvencies. Whether the euro requires a more centralized fisc in order to rival the dollar as a reserve currency is, however, a different matter. 8. Conclusion The great credit crisis of 2008/9 has highlighted the strengths and weaknesses of Europe’s unprecedented experiment with a single currency. It has demonstrated that the euro area possesses a central bank prepared to respond quickly to distress in European financial markets, if one at the same time strangely reluctant to expand the money supply in response to the danger of deflation. It has showed that life for small European countries is more comfortable inside the euro area than outside – few if any incumbent members have seriously contemplated exiting, while a number of traditionally euroskeptical EU member states now regard joining the euro area more favorably as a result of the crisis – even if the straitjacket of a single monetary policy is uncomfortable given the magnitude of the asymmetric shock. The crisis has also exposed the contradictions of a Europe in which there is a single market for financial services dominated by a handful of large cross-border banks but a number of different national regulators, each with responsibility for the Europewide operations of banks licensed in its jurisdiction. The gravity of recent banking problems suggests that cooperation among national authorities, whether in the form of colleges of regulators or Level 2 committees, will not suffice. Ultimately, Europe will either have to move forward toward more centralized supervision and regulation, presumably in the form of a European System of Prudential Supervision – a powerful EU-level authority to which national supervisors report and whose instructions they carry out, in a manner analogous to the relations between the ECB and euro area national central banks – or it will have to move backward to the renationalization of its financial markets. Given the EU’s investment in its single market, in finance as in other goods and services, moving forward toward centralized supervision is more likely. But doing so will not be easy. Political resistance will have to be overcome. And the architecture of the new arrangements will not be straightforward. Situating the European System of Prudential Supervision outside the central bank may create problems of information sharing and policy coordination between the euro area’s supervisor and crisis lender. But placing it inside the central bank will be impossible so long as the borders of the euro area and Europe’s single financial market differ. The only solution is for member states outside the euro area to leave the single market or, more likely, to adopt the single currency. All this is a reminder that Europe’s current structural challenges will not be dispatched easily. Reference Ahearn, Alan, Juan Delgado and Jakob von Weisacker (2008), “A Tale of Two Countries,” Bruegel Policy Brief no.2008/4 (June). Andre, Christophe and Nathalie Girouard (2008), “Housing Markets, Business Cycles and Economic Policies,” unpublished manuscript, OECD (September). Angus Reid (2008), “Swedes Divided on Euro Adoption,” Angus Reid Global Monitor, www.angus-reid.com (10 December). Bernanke, Ben (2009), “The Crisis and the Policy Response,” Stamp Lecture, London School of Economics, www.frb.org (13 January). Bini-Smaghi, Lorenzo (2009a), “The Euro Area’s Exchange Rate Policy and the Experience with International Monetary Coordination since the Crisis,” www.ecb.int (April 6). Bini-Smaghi, Lorenzo (2009b), “Regulation and Supervisory Architecture: Is the EU on the Right Path?” Speech to 2009 ECON meeting with National Parliaments, 12 February, www.bis.org. Blanchard, Olivier (2006), “Adjustment within the Euro: The Difficult Case of Portugal,” unpublished manuscript, MIT. Blanchard, Olivier and Francesco Giavazzi (2002), “Current Account Deficits in the Euro Area: The End of the Feldstein-Horioka Puzzle?” Brookings Papers on Economic Activity, pp.147-209. Chinn, Menzie and Jeffrey Frankel (2008), “The Euro May Over the Next 15 Years Surpass the Dollar as the Leading International Currency,” NBER Working Paper no.13909 (April). Committee of European Banking Supervisors (2009), “Template for a Multilateral Coordination and Cooperation Agreement on the Supervision of XY Group,” www.cebs.org (27 January). De Grauwe, Paul (2009), “Nichts Heiliges an der Ein-Prozent-Marke,” Der Standard (20 April), www.derstandard.at. De Larosiere, Jacques (2009), The Report of the High Level Group on Financial Supervision in the EU, Brussels: EU (February). Eichengreen, Barry (2007), “The Break-Up of the Euro Area,” NBER Working Paper no. 13393 (September). Eurointelligence (2009), “Majority of Swedes Want to Introduce the Euro,” Eurointelligence, www.eurintelligence.com (21 April). Gros, Daniel (2006), “Bubbles in Real Estate: A Comparative Longer-Term Analysis of Housing Prices in Europe and the U.S.,” CEPS Working Document no.239. Hallerberg, Mark and Guntram B. Wolff (2006), “Fiscal Institutions, Fiscal Policy and Sovereign Risk Premia,” Discussion Paper no. 35/2006, Frankfurt: Deutsche Bundesbank. Hilbers, Paul, Alexander Hoffmaister, Angana Banerjie, and Haiven Shi (2008), “House Price Developments in Europe: A Comparison,” IMF Working Paper no.WP/08/211 (September). International Monetary Fund (2008), “Housing and the Business Cycle,” World Economic Outlook, Chapter 3 (April). International Monetary Fund (2009), World Economic Outlook, Washington, D.C.: IMF (April). Mongelli, Francesco Paolo and Charles Wyplosz (2008), “The Euro at Ten: Lessons and Challenges,” unpublished manuscript, Graduate Institute of International and Development Studies, Geneva (December). Nitsch, Volker (2004), “Have a Break, Have a…National Currency: When Do Currency Unions Fall Apart?” CESifo Working Paper no. 1113 (January). Osborne, Jenny (2005), “Housing in the Euro Area: Twelve Markets, One Money,” Quarterly Bulletin 4, pp.87-114. Oxlade, Andrew (2005), “Spain Tops Europe House League,” www.ThisIsMoney.co.uk (4 March). Saiz, Albert (2007) “Immigration and Housing Rent in American Cities,” Journal of Urban Economics 61, pp.345-371. Schoenmaker, Dirk and Sander Oosterloo (2008), “Financial Supervision in Europe: A Proposal for a New Architecture,” in Lars Jonung, Christoph Walker and Max Watson (eds), Building the Financial Foundations of the Euro: Experiences and Challenges, London: Routledge, pp.337-354. Soros, George (2009), “The Eurozone Needs a Government Bond Market,” Financial Times, www.ft.com (18 February). Trichet, Jean-Claude (2009), “Restoring Confidence in the Global Financial System,” Speech at the annual meeting of the Research Institute of Japan, Tokyo, www.ecb.int (17 April). Van den Noord, Paul (2004), “Modeling Cyclical Divergence in the Euro Area: The Housing Channel,” OECD Economics Department Working Paper no.400 (September). Von Hagen, Juergen and Charles Wyplosz (2008), “EMU’s Decentralized System of Fiscal Policy,” Economic Papers no. 306, Brussels: European Commission. Wagstyl, Stefan (2009), “IMF Urges Eastern EU to Adopt Euro,” www.ft.com (5 April). 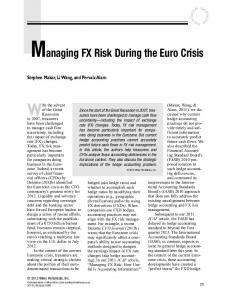 Report "The Crisis and the Euro"